Once a lonely little village on the road from Denpasar to Bukit Peninsula, Kuta is now the tourist Mecca of Bali, popular mainly among the young and adventurous. 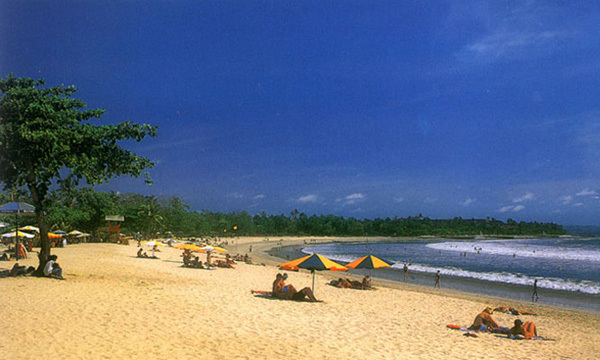 Kuta beach is one of the first favorite beaches discovered by tourist. Coconut trees line the sand beach as far as the eyes can see towards the north stopped by the runway of Denpasar's airport far in the west. The sunset in Kuta is most breathtaking. On the south, the beach is fenced by the airport's runway, which gives the visitors a breathtaking landing experience. Kuta Beach bustles with tourists' vendors and locals. It's the most popular beach in Bali and the island's number one party zone. The beach stretches as far north as the eyes can see. As short walk away north, the waves will invite to surfing. Rapid development and an influx of visitors haven't kept the surfers away and Kuta still remains one of Bali's best surfing beaches and a great place to enjoy a beach lifestyle. While the surfers are still part of the Kuta scene, it's the shopping, nightlife and party vibes that attracts thousands of visitors. There's a huge choice of accommodation, restaurants and entertainment. The accommodation in Kuta range from a modest home stay for a few dollars a night to luxurious, five star, international hotels costing several hundred to several thousand dollars a night. Legian Street, situated directly behind the row of hotels that face the beach, is lined with shops of all varieties. We can find any Balinese handicrafts here, from the least expensive to the most exquisite; or unique stores such as the leather store staffed by two young Balinese men that will perfectly sculpt a leather jacket. (They are all extremely talented artists). _At night, Kuta is alive with night life. Western influences create discotheques, dance clubs, and pubs. Gastronomical demands inspire a multitude of restaurants, serving traditional Indonesian and Balinese food to various ethnic meals from Japan, Switzerland, etc. As if these were not enough, various Balinese dance performances are staged in Kuta every night. One of the best Kecak performances is found in Kuta.